Just as every pet is unique, every yard is unique. 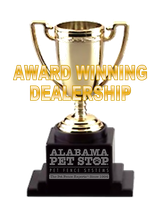 At Pet Stop of Alabama, we'll work with you to design a system layout that accomplishes your goals and satisfies your pet's needs. Typically our pet fences are installed using one of the following layouts, or a variation. However, we can create customized layouts if needed. We'll listen to your requirements, then help you create a system that works for you - outdoors, indoors, or both. Definitely the most popular layout available, the Perimeter Layout encloses your entire yard, Your pet will be able to romp to their heart's content on your whole property, without worry of escape. While the Perimeter Layout encloses your entire yard, you can have your garden, pool, playset, or flower beds wired as an off-limits area for your pets. They'll still be able to enjoy exercising on your whole property, without trampling your plants or chewing up the kids' swings. This layout is also very popular. 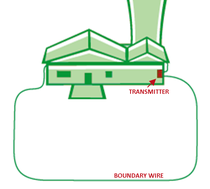 Instead of enclosing the entire yard, the front and back yards are protected separately - the space between is a restricted zone. In order to move between the front and back yards your pet will need to go through the house, allowing you more control over your pet's movements. Sometimes the front yard is not a good place for pets. Whether it's prized landscape areas to protect, a pet-free kids' play zone, or simple preference, this type of layout is also very popular. 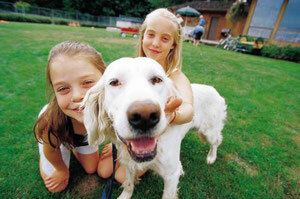 Your pets can have full back yard access, and be allowed inside without crossing a boundary. If someone leaves a door open, no problem. All exit points are covered to prevent escape. This layout encloses either the front or back yard only, using the house as part of the boundary. While very useful when necessary, it is less popular than most other layouts. 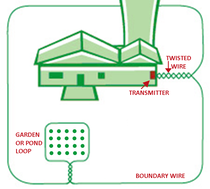 The Double-Loop is generally used when your property's obstacles prevent the installation of a Back Yard Single Loop or Hourglass layout. We can install wire in water to complete the required closed circuit. 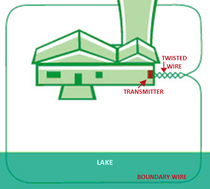 When the submerged stretch of wire is in shallow water (6 ft. deep or less), your dog will learn to respect that boundary just like the ones on land. In deeper water, dogs may swim over the wire, making it unreliable to contain dogs that are real swimmers. Since lake installations can vary a great deal, we will want to discuss your lake job in detail to insure your satisfaction. If you want your dogs to be free to swim or wade but still confined to your property on land, this layout may be the right one for your situation. 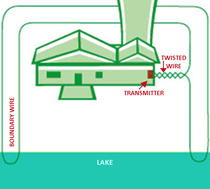 This "inverted double loop" layout is great for retriever exercises, or dogs who love to swim. Since lake installations can vary a great deal, we will want to discuss your lake job in detail to insure your satisfaction. 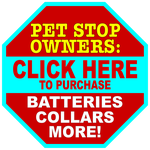 Keep your pet away from certain areas of your home with out Indoor Transmitter. 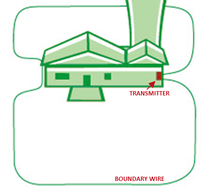 Our RoomWizard™ Indoor Transmitter features the same extremely customizable settings and features as the outdoor transmitters, and it can be used either wired or wireless.